If a disease has several treatment options, then there is not one “good” one. To highlight how difficult it is for many patients to decide what to do about their prostate cancer, consider the gallbladder. If it needs to be treated, there is one option: remove it. Once you decide to remove it, there is for the most part only one way it is removed: an hour-long laparoscopic outpatient procedure. If you have been having issues related to the digestive tract because of a sick gallbladder, all of those pesky symptoms go away once it is removed. Most patients are back to normal within a week or so. Prostate cancer is very different. Prostate cancer has several treatment options and almost all will result in some change in voiding and/or sexual function. In addition to the concerns of the patient about whether he’ll be cured or not, he has to worry about symptoms that are going to be caused by the treatment and not by the disease. The symptoms that can occur strike right at the heart of the male patient’s pride (if he has debilitating voiding symptoms) and his sexuality (if his erections worsen). To make matters worse, some patients have favorable parameters indicating the slow-growing type of prostate cancer and may be completely symptom-free, but they are still faced with a decision about whether to undergo treatment. This patient is the one most troubled by the decision because he has to walk the fine line of limiting risks versus getting cured. He doesn’t want to over-treat the cancer, subjecting himself to all the risks, but he doesn’t want it to come back either. Having prostate cancer, even low grade and low volume, is a lot like being a “little bit pregnant.” Once you know you’ve got it, you have to deal with it (even if dealing with it is to choose surveillance). It is understandable why so many newly-diagnosed prostate cancer patients are frustrated by having to make the decision to pursue one treatment over another. Though making a decision about which treatment to pursue is stressful, the vast majority of patients do well in terms of their prostate cancer and the treatment chosen. I often tell patients that they should expect the diagnosis and treatment to be a “major inconvenience” and the likelihood is that they will do fine and probably die of something other than prostate cancer. The trick is matching the patient to the right treatment and not allowing misconceptions or half-truths to drive the decision. In order to come to a decision as to what form of treatment, if any, you want to pursue for your cancer, you need to understand the particulars of the various treatment options and how each will impact you. In addition, all the factors should be considered specifically as they apply to you. 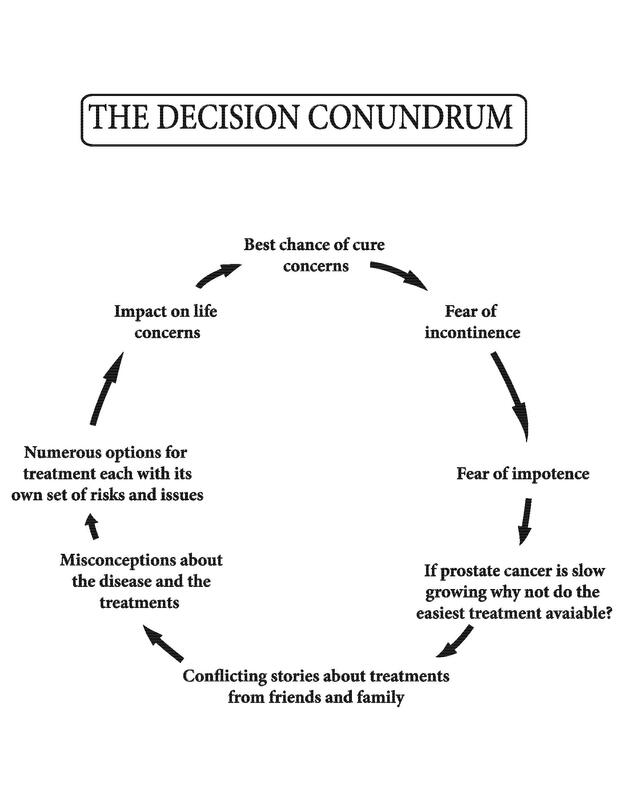 In medicine, decisions regarding a disease that has several available treatment options are the hardest to make. The decision regarding the treatment of your prostate cancer is no exception. I have spent hours with some patients over several weeks as they anguished over the pros and cons of the various treatment options in trying to decide which one was the best fit for them. To streamline the process, I am simplifying the treatment options to surgical removal of the prostate and radiation. Although some patients will choose cryosurgery (freezing the prostate), most patients choose between the various forms of radiation or surgery. Even if you are considering something other than these two major forms of treatment, the first decision is still whether you want to opt for surgical removal or something else. Your first task is to consider the big concept of “are you a surgery type or a radiation type?” Once this big decision is made, then the nuances of each particular treatment and its effects on you can be further considered. I will help you understand how characteristics about who you are and what is important to you are necessary ingredients in making “the decision.” In addition, (by clarifying the potential risks of each treatment.) I will help you match the treatment to your particular situation and make your decision for the right reasons. Patients often latch on to one aspect of a treatment and make an ill-informed decision based on that alone, and my goal is to help you avoid that. Your decision should be based on numerous factors that are relevant only to you, meshed with the pros and cons of each of the options. For the purposes of the following discussion, removal of the prostate, radioactive seed therapy (brachytherapy), and cryosurgery are operative procedures requiring anesthesia. Removal of the prostate (either by open surgery or by the robotic method) is more invasive, requires an incision or incisions, and has the highest associated operative risk. 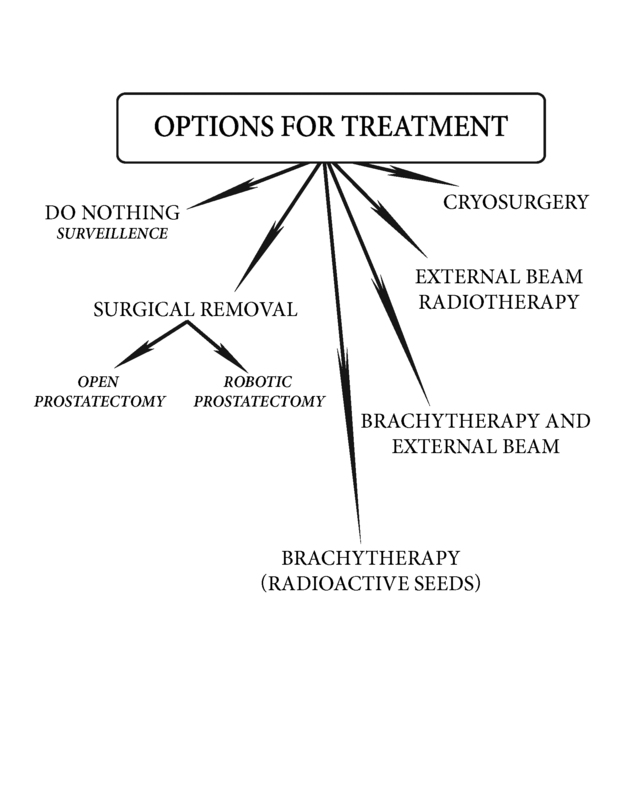 Unlike these treatments,, external beam radiotherapy is not considered an operative procedure, is similar to having 42 consecutive x-rays, and hence, for the most part, is not limited by the patient’s underlying health. All available treatments have the potential for risks. All of the treatments will affect how you void and the quality of your erection. In deciding on one form of treatment, the patient should have a clear understanding of the potential risks and which of those risks are most important to him. This allows the patient to match his decision to his particular health situation. Life-threatening complications can occur in surgery, including blood loss, problems with anesthesia, postoperative infection, deep vein thrombosis, and heart attack, but these occur very rarely. Dramatic complications can also occur with radiation. Adverse effects on surrounding organs, problems with anesthesia (if you choose seeds), and other prolonged deleterious effects of the radiation can occur, but these also are uncommon. I have elected to discuss the problems that occur most commonly and those that patients deal with most frequently. The most common risks of surgery are the potential for incontinence or worsening of erectile function, and the most common risks of radiation are an exacerbation of obstructive voiding symptoms, initiation of irritative voiding symptoms, worsening of erectile function, and short and long-term problems related to the effect of radiation on the organs that surround the prostate (primarily the bladder and the bowel). The worst thing that can happen to favorable short-term results is long-term follow up. A patient of mine had recently been told his biopsy was positive for cancer, and he was in the office for the follow-up of his metastatic work-up (a C.T. scan looking for any lymph node involvement and a bone scan looking for bone involvement). In the middle of our discussion, I was called to the phone. When I returned a few moments later, the patient, a professor at a nearby college, had outlined all of the pros and cons of surgery and radiation on the exam table paper. It was very extensive and considered everything in terms of risks and options, with underlined words and arrows all over the paper. He was looking at what he had produced with his hand to his head as if he were pondering all the scenarios. I commended him for becoming so knowledgeable about prostate cancer and its treatments, but he said, “I am no closer to a decision than I was two weeks ago. This is tough.” We talked some more, and he indicated he needed more time to decide. As we were leaving the room, he tore off the exam table paper, folded it nicely into a small square, and tucked it into his back pocket. I have him to thank for this particular chapter. He made me see how difficult it can be to arrive at a decision and, hence, the need for this book. He ultimately chose radiation therapy and had seeds without external beam radiation, and he did well. I saw this patient several months after his radiation to check his PSA and told him I was going to put the “exam table paper” anecdote in my book. He said, “I remember that; I still have that piece of paper.” He then said something that surprised me: “Do you think I made the right decision?” Let me say it again, this decision is difficult, and there can be a lot of second-guessing even after the most thorough and thought-out decision. I told this patient that I did think he had made the right decision. He was certainly doing well in the short term. He had experienced only limited voiding symptoms and had dodged the early problems related to radiation, and that was a good start. Whether the cancer will come back and what effect the radiation will have on his sexual function are questions that will only be answered with time. This is another reason not to place too much emphasis on what someone else might recommend if he is in the short-term time frame of having had his own treatment. With prostate cancer, one must consider getting through the treatment itself and then weathering the aftermath of the treatment. One must know both the short-term and long-term consequences of all treatments to adequately make the decision; to consider one and not the other can lead to unhappy results.